What if today wasn’t the today we were supposed to have? What if the present was supposed to be the future that was dreamed of in the 50s and 60s—with flying cars, teleportation and jet packs? What if we somehow ended up with the wrong today? 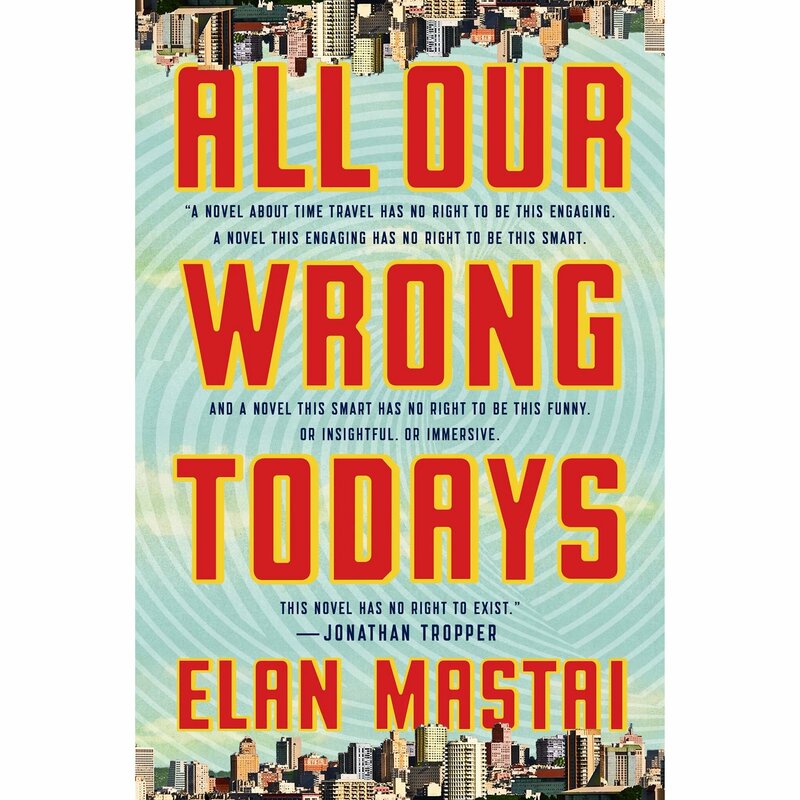 That’s the premise of Elan Mastai’s debut novel, All Our Wrong Todays. The book has a solid core of science fiction, but with a lot of dark humour and a sprinkle of heartfelt romance, wrapped into one futuristic story that hops between what could be and what actually is. All Our Wrong Todays centres around Tom. Tom lives in a world where teleportation and space travel are passé. Family vacations to the moon are mundane. The world runs on sustainable, renewable energy. It is the perfect future, but today, in 2016. As the son of a prominent scientist, Tom is frequently overshadowed by his father and his incredible work involving the newest frontier: time travel. After the sudden death of his mother, Tom grudgingly helps his father with his time travel pet project. Except it doesn’t take long before things go horribly wrong. Mastai’s film, The F Word, received critical acclaim. What was supposed to be a great discovery soon spirals into a disaster of monstrous proportions after Tom sends himself back in time, accidentally altering the timeline and completely changing the future. Suddenly, Tom finds himself in our today. No renewable energy, no flying cars, no jetpacks. Now, Tom must find a way to fix his mistake without screwing things up even more. Though this is Mastai’s first novel, he is no stranger to storytelling. The Concordia communications graduate has been writing screenplays since he was in high school. His most recent film is The F Word, starring Daniel Radcliffe, Zoe Kazan and Adam Driver. The film was nominated at the Canadian Screen Awards for Best Picture, and won Best Adapted Screenplay. That interest in technology and the past’s perception of the future followed him throughout university. At Concordia, he had the opportunity to think about it differently through the different theories in his Communications classes. When Mastai was thinking about his story, he knew it needed to be told through a book. But transitioning from writing screenplays to writing a novel had its challenges. Screenplays follow a format—no matter the genre, tone or length, the style remains the same. The writing is lean and visually dynamic, and screenplays are always written in the third person and in the present tense. Working on the novel gave Mastai complete creative freedom of expression—a freedom that doesn’t exist with screenplays, which is a more collaborative medium. Mastai has already sold the rights to Paramount, and begun work on adapting the book into a screenplay. Just as learning how to write a novel posed its challenges, the same goes for the process of adaptation. All Our Wrong Todays is the amalgamation of the topics and ideas Mastai studied during his degree at Concordia, wrapped in a veil of narrative storytelling. Though technology is the cornerstone of the book, the story is told through the decisions the characters make.